Operations Management. A streamlined process pays off in predictable and sustainable revenue. Get the job done right, on time and within plan. It’s the goal of every business. But actually accomplishing this goal can be a challenge. 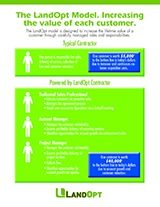 LandOpt provides a process that everyone in the organization can use to stay on track. You’ll start with a realistic spending plan and learn how to accurately estimate jobs based on data, how to keep costs under control, and how to create sustainable revenue through proactive sales. Establish accurate job costs and production schedules. Track profitability and measure outcomes. Learn effective customer service procedures and strategies. Use cost analysis to identify performance issues. Give team members realistic checkpoints to measure progress. The results: Employees take ownership and pride in their work. Customers enjoy better service which enhances your reputation and leads to a more profitable bottom line.